APR Applied Pharma Research s.a (APR), the Swiss developer of science driven and patent protected healthcare products, is pleased to share the success of a special event, “Test the taste”, addressed to Phenylketonuria (PKU) patients and organized with the purpose of allowing them to test the company innovative Phenylalanine (Phe)-free medical food for PKU management. 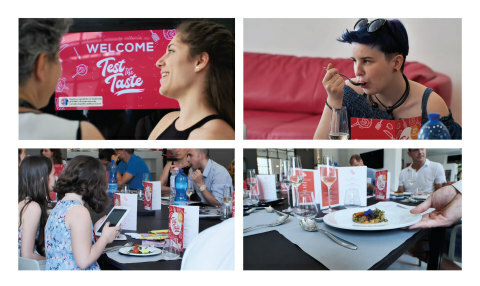 The initiative, promoted by the APMMC, the Italian patients association of inherited metabolic diseases with the unconditioned support of APR, aimed at gathering genuine feedbacks from PKU patients and their families on the company innovative medical food palatability in a friendly and relaxed setting - a Sunday lunch. During the lunch, a well-known chef prepared, under medical supervision, a full menu suitable for a PKU diet, made of four dishes - from appetizer to dessert, each of them including APR Phe-free amino-acids (AA) supplementation. After each course, patients and caregivers, who did not receive any information about the company innovation, were asked to assess the supplemented food just enjoyed (under medical guidance) as per texture, odor, taste and after-taste by filling out a brief questionnaire. For a complete evaluation, appetizer was served twice, with and without APR’s Phe-free AA mix, to allow the audience to better grab the differences. Responses from both patients and families are extremely positive: no remarkable differences were reported in terms of odor and taste after sampling the appetizer with or without the AA mix. According to the guests, APR innovative Phe-free supplementation did not affect the overall food taste and odor as the opinions expressed on the dishes served mostly referred to either the flavor or the texture of the ingredients regardless of the AA mix. The most noticeable feedback is the one regarding the aftertaste of the AA mix, which, as reported by PKU patients, could impact negatively their food experience: APR Phe-free AA mixture was markedly appreciated. “At last thanks to APR’s new AA mix we have the chance to enjoy a delicious lunch without worrying about odor, taste and aftertaste of the supplementation.” said a patient who participated to the initiative “Food palatability was really great and we are eager to test this innovative AA mix a variety of recipes! We hope to find soon APR’s AA mix available as it can help us as patients to achieve a lasting and rewarding compliance to the compulsory dietary regimen”. “As father of a PKU teenager and having gone through the troubles of a strict long-life dietetic treatment, we are very proud to offer to patients a new perspective of quality of life. Our dream is to make a real difference for those who live and deal with PKU.” said Paolo Galfetti, CEO of APR. APR’s innovative and patented Physiomimic Technology® is able to remarkably mask the naturally unpleasant taste and the odor of some amino acids, offering a considerably palatable medical food, which can be easily accepted by patients, thus supporting their compliance and impacting positively their quality of life. On the other side, as shown in a recent kinetic study, APR’s advanced formulation of AAs, by providing amino acids in more physiological manner (mimicking that of dietary proteins), has the very encouraging potential of contributing to maintain Phe levels within the recommended ranges, with less prominent fluctuations of Phe over time, thanks to a prolonged release of AAs in the gut. Further preclinical studies as well as clinical evidences are underway to reinforce the scientific profile of the innovative medical food. APR will present officially its new range of Phe-free medical food for PKU dietary management, as well as new original scientific data, at the next Annual Symposium of the SSIEM (Society for the Study of Inborn Errors of Metabolism) on September 4th-7th in Athens, which will be the occasion for attendees to get to know APR’s innovation and the patented technology behind it.